Rolls-Royce is leading a highly specialised challenge to build the worlds fastest all-electric aircraft, with the zero-emissions plane expected to make a run for the record books with a target speed of 300+ MPH (480+ KMH). Inside a bustling hangar bay at the far end of Gloucestershire airport in South West England, a team of British engineers, designers and data specialists recruited from across Rolls-Royce and beyond have set out to make history. 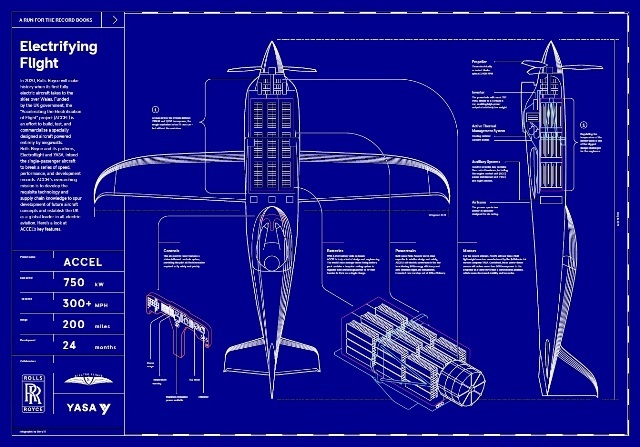 They are building a high-performance electric aeroplane unlike anything the world has ever seen. Scheduled to take to the skies over Great Britain in 2020, the aircraft will reach a speed of 300 mph – and quite likely more – making it the fastest all-electric plane in history. This run for the record books is no stunt. It’s part of a Rolls-Royce initiative called ACCEL – short for 'Accelerating the Electrification of Flight' – that is intended to pioneer a third wave of aviation in support of Rolls-Royce’s strategy to champion electrification. ACCEL is partly funded by the UK government and involves a host of partners including electric motor and controller manufacturer YASA and the aviation start-up Electroflight.